There are many mysteries in life as the Boudreau sisters, Martine (age 11) and Eliane (age 6), discover when they set out to catch spies during World War 1. Families are fleeing war torn Paris and the girls, rather than go to the country, determine to aid the war effort by ferreting out German spies. A mysterious woman’s finger tapping and access to high security public buildings makes her a prime suspect. It turns out to be Madame Curie, whose two Nobel prizes have brought her international acclaim. But her comings and goings in and out of Paris are very suspicious and the girls, who have become minor celebrities themselves for their fundraising efforts on Mme. Curie’s behalf, might be accessories to her plot. 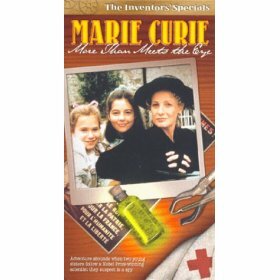 Madame Curie is, in fact, helping to save lives through her research and Martine and Eliane learn that curiosity is essential to exploring science and life. On Aug. 15, 1914, in her fathers Paris photography studio, 11-year-old Martine Boudreau is sifting through his pictures and photography paraphernalia. At one point, she idly points a lens out the window of the familys apartment and happens to focus on a striking-looking woman on a bicycle, who she doesnt know is Marie Curie. Martine's father, Gerard, has been ordered to the front in the war against the Germans. Martine, her younger sister Eliane, and her mother Lisette see Gerard off at the train station, where they meet Aunt Celine, who, like many Parisians, is fleeing the city in fear of the German advance. Celine promises Lisette that she will take in Martine and Eliane if they need to be evacuated. Coincidentally, Curie is at the station as well. Martine is perplexed by a strange box Curie is protectively carrying. Martine and Eliane think they have extracted a promise from their mother that if they can help the war effort they wont be sent to the country to live with Celine. Together, their overactive imaginations and another chance sighting of the seemingly strange-behaving Curie make them think theyve stumbled upon a German spy. They follow Curie to her laboratory, which "glows" and reinforces their suspicions. Even when Curie confronts them and allows them a brief glimpse into her life, they keep their cool--as any pair of good spycatchers would. At home, their fantasies run even wilder, thanks partly to their neighbour, Mrs. Yolles, who says she doesnt trust "that Curie woman"--even if she did win a Nobel Prize. Martine and Elaine start seeing spies everywhere--but time is running out if they hope to stay in Paris. One night, Martine hears their mother telling Aunt Celine that she will be sending the girls to her by the end of the week. With the war worsening, Marie Curie and her daughter Irene intend to take their mobile radiography unit where its needed most: to the battlefront. They are denied permission by a narrowminded military captain but refuse to be cowed. Continuing their "surveillance" of Curie and Irene, the girls become certain the woman is an enemy agent. Gerards camera has been sent back, without explanation, from the front. Fearing the worst, Lisette develops the film in the camera and sees, in black and white, the true horror of war. She tries to keep this from the children, but Martine learns of the cameras return. Distraught, she flees the house, intending somehow to get to the front, find her father and "save France." As luck would have it, Curie is preparing her radiography van for a surreptitious trip to the front, and Martine seizes the moment to play stowaway in the back. As the van departs, Eliane runs home to alert their mother to this latest turn of events: that Martine has been kidnapped by spies! With their chauffeur Louis at the wheel, Curie and Irene arrive at the front. Martine is discovered. As Curie and Irene set to work X-raying soldiers before surgery, Louis begins to explains to Martine the true story behind Curies "mysterious" mission. In a quiet break from her work, Curie completes the explanation and then demonstrates her lifesaving device. Meanwhile, Lisette, Mrs. Yolles and a neighbour, the starving artist Peter, are driving like mad to what they think is the rescue. Suddenly, the French army captain who had ordered Curie not to come to the front bursts in to the hospital. Irate, he orders them to leave. As they are packing to go, Martine wanders by a ward where she sees her wounded father, who is about to have his leg amputated. She rushes out and implores Curie to do one more X-ray. Emboldened by the girls vehemence and courage, Curie complies. Gerard’s leg is saved. Lisette arrives just in time to hear the good news. And there is more good news: The German army is retreating. Back in Paris, Gerard is recuperating well. Peter the artist is starving no more, now that Mrs. Yolles is helping to sell his paintings. Alas, Marie Curies work must continue. As the film concludes, she is heading back to the front. The woman destined to be known worldwide as Madame Curie was born Marie Sklodowska in Warsaw, Poland, on Nov. 7, 1867. The Sklodowskas were members of the impoverished Polish bourgeoisie, and her father struggled to support his large family as a high school teacher of physics and mathematics. He was apparently a brilliant man, and Marie learned both from his example and from his hands-on teaching, developing into a brilliant young student herself. But her mother suffered from tuberculosis and, hoping to spare her children, decided one day she could never touch them again. Marie was five years old at the time, and it is thought that her lifelong aversion to public displays of affection sprang from being denied physical affection as a child. At age nine, she was greatly pained by her mother's death; it was not the last time that she would lose a crucial loved one. As a young woman, Marie poured herself into her studies, which perhaps represented the one world she could control. From 1885 to 1889, she selflessly worked as a governess, sending her earnings to her older sister, Bronya, who was studying medicine in Paris. Then, when her own turn came at the Sorbonne, she hit the books with a ferocious determination, graduating first in her class--the first woman to earn a Liciencee es Sciences Physiques. A Ph.D., which she earned in 1903, was a foregone conclusion. Maries life blossomed personally and professionally when she met Pierre Curie, a brilliant young French physicist. They were married in 1895 and eventually had two daughters, Irene and Eve. Together they decided to further A.H. Becquerel's investigation of the radioactive properties of uranium. For the scientific world, 1898 was a turning-point year--thanks to the Curies: In July, they announced the discovery of a new radioactive element, polonium (named by Marie after her motherland); in December, they announced their discovery of radium. Their next step was to isolate both elements. Poorly equipped and underfunded, they spent the next three years doing precisely that--and in 1903 jointly won the Nobel Prize in Physics for their efforts. She was the first woman to win the award. Life seemed to promise many more firsts for the Curies. They were both given prestigious positions at the Sorbonne--he as full professor, she as chief of laboratory work--but the glow of success was soon tragically extinguished. On a Paris street on April 19, 1906, Pierre Curie stepped in front of a horse-drawn carriage and was killed instantly. Confronted with the loss of her husband, best friend and indefatigable colleague, Marie Curie retreated to the laboratory, redoubling her efforts to isolate a sample of pure radium. Successfully doing so won her a second Nobel Prize, this time for Chemistry, in 1911. The following year, the University of Paris and the Pasteur Institute founded the Radium Institute, a long-overdue, properly funded recognition of her value to science. Thanks to Marie Curie, the medical profession finally had a potent weapon in the battle against cancer, and radiation treatment soon became common practice. The outbreak of World War One, though, posed a challenge tailormade for Curie. After overcoming stout resistance from the French military, Curie, assisted by her daughter Irene, spearheaded the use of X-rays as a pre-operative tool in war-zone hospitals. Eventually, mobile radiological vans, nicknamed "Petite Curies," were deployed along the Western Front. (This achievement is a key element of the film Marie Curie: More Than Meets the Eye.) In the final year of the war, 20 Petite Curies and 200 radiological outposts took some 1,100,000 X-rays of wounded men. Yet for all of her own lifesaving contributions, Curie was undone by her past. Despite her mothers drastic measure, she may have contracted tuberculosis anyway; she was never robust, suffered from lung problems, and often had to tear herself away from work to rest in the French countryside or at sanitaria in Switzerland. To what degree she fatally exposed herself to radiation will never be known; certainly, she was chronically tired and her fingertips were permanently sore. In any event, the immediate cause of her death, on July 4, 1934, was listed as pernicious anemia. She was buried in the Paris plot already occupied by her beloved Pierre, with some Polish soil tossed atop her coffin by her big sister, Bronya.